Should new MPs be given lessons in how to debate? 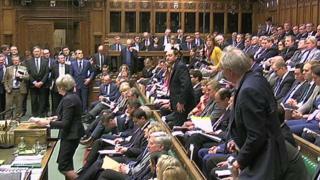 New MPs should take part in mock debates to build up confidence before entering the Commons bear pit, a committee of senior MPs has said. The report also recommends giving newly elected members a guide to London transport to help avoid confusion. Some new MPs said they struggled with Oyster cards – the travel passes used on buses and the Underground – when they arrived at Westminster. The report was produced by the Commons Administration Committee. Newly-elected MPs face the twin challenge of learning the sometimes arcane rules and procedures of the House and finding their feet in London, if they have not lived there before. Martyn Day, one of 56 new SNP MPs elected in 2015, said he initially struggled to get to grips with the city’s Oyster card system. “I come from a town where I can pay by cash and get change, but if you do that everybody shouts at you on the bus,” said the Linlithgow and East Falkirk MP. The mock debate idea comes from New Zealand’s parliament. Parliamentary Clerk Assistant, John Benger, told the committee practice debates, held on a “party-by party” basis could help new members understand some of the more arcane Commons rules and traditions. Labour’s Jess Phillips, elected to represent Birmingham Yardley in 2015, told the committee new MPs were often worried about making a mistake in their first weeks. When MPs arrive at Westminster for the first time they gather at a New Members’ Reception Area, where they are issued with security passes, IT equipment and access to expenses and travel office accounts. At the last election the Parliamentary authorities launched a “buddy” system which paired up the new arrivals with members of staff who showed them how the place worked. The scheme was judged a success by the administration committee in its report. But the practice of giving MPs lockers in committee rooms and allowing them to “hot desk” while waiting to be given their own office – introduced at the last election – was criticised on data protection grounds. “There is not enough space in the locker after four weeks of correspondence coming in, so correspondence gets left in the committee rooms and, as soon as that happens, the member is breaking the law. It is a problem,” said Emily Knight, of the Members’ and Peers’ Staff Association.